What you’re looking at is a blackboard located at my local IKEA which I recently visited. Now I am mostly an open-minded person but I am quite averse to worshiping characters of any kind, whether religious, fictional, good or evil, when I am browsing home furnishings. I can only imagine the kind of chaos that would ensue if someone got down on their knees and started to worship a fallen angel near the sofa department. That I do not want. If I am going to spend two hours of my life on a Saturday afternoon slowly walking around the various sections of IKEA I would rather try to avoid a small group of people clustered around a statue or photo, with fire in their eyes, bowing up and down. Luckily for me, they were done by the time I passed. Do yourself a favour; steer clear of furniture-loving Satanists. 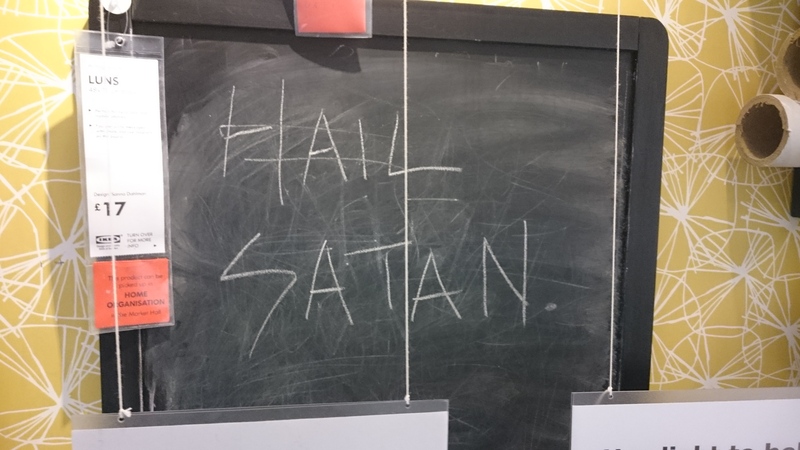 There’s a bit too much Satanism in Ikea these days, if you ask me. It might appeal to the heretic market in Sweden but it’s a turn off for me. What’s next? Lucifer on a bathmat? Mephistopheles adorning a series of sofa pillows? How about the new Dark Lord door handles, its a step too far for me. I will say this, though, the satanic candle range is lovely. They burn for ages and the fragrance is delightful. Yeah, the aroma of searing flesh can be lovely to unwind after a stressful day in the office. May I suggest some sort of Kevindo Menendez bean-candle crossover then? Who doesn’t love the smell of burning beans? I’m not sure I do. And I doubt it would get many takers in Scandinavia. It’s just not Satanic enough. Let’s see. Why not utilise your circus of mice, currently on hiatus until the summer months, to doodle pentangles and crosses on the Beans? Or the candles? They’re good at drawing. They are but you can’t tell them what to draw. They go where their artistic muse takes them. Don’t stifle their creativity.